By comparing the properties and capabilities of each desiccant product, it's possible for you to identify the correct desiccant for your needs and make a clear choice. The indicating silica gel of the Dri-Box canister has been tested and identified by our experts as the best solution and value for small scale electronics protection under normal extremes of temperature; however, we present the following figures and tables for your edification. Remember, help is only an e-mail away! Montmorillonite Clay is a naturally occurring porous adsorbent. The mined clay is activated for use as a desiccant through careful drying. This clay will successfully regenerate for repeated use at very low temperatures without substantial deterioration or swelling. However, this property causes clay to give up moisture readily back into the container as temperatures rise. 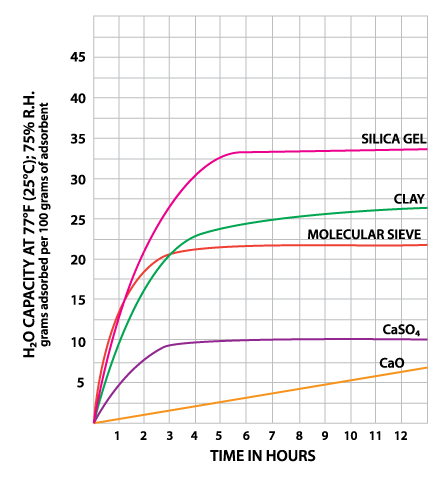 Clay is inexpensive and effective within normal temperature and relative humidity ranges (Table 1). Some variation in performance can be seen due to its source as a naturally occurring material. Silica gel is a partially dehydrated form of polymeric colloidal silicic acid. Silica gel has an amorphous micro-porous structure with a distribution of pore opening sizes of roughly 3-60 angstroms. These interconnected pores form a vast surface area that will attract and hold water by adsorption and capillary condensation, allowing silica gel to adsorb up to 40% of its weight in water. Silica gel is extremely efficient at temperatures below 77°F (25°C) (see Figures 1 and 2), but will lose some of its adsorbing capacity as temperatures begin to rise, much like clay (Figure 3). Much of silica gel's popularity is due to its non-corrosive, nontoxic nature and its having received US government approval for use in food and drug packaging. Molecular sieves (also known as Synthetic Zeolite) adsorb moisture more strongly than either silica gel or clay. 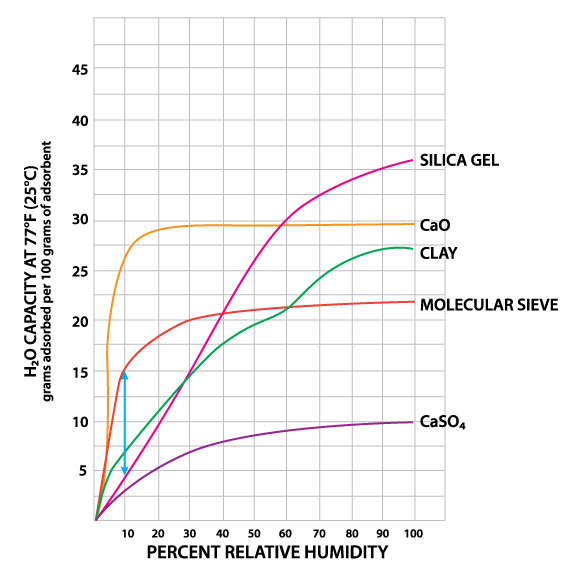 This can be seen by the high initial slope of the adsorption isotherm for molecular sieve as compared to the other desiccants (Figure 2). This can also be seen in comparing their heats of adsorption for water. The heat of adsorption is the sum of the latent heat of vaporization of water and the heat of wetting. The heat of wetting will vary as a function of the saturation level of the desiccant. For purposes of comparison, the heat of adsorption for water on molecular sieve is about 1800 BTU/lb. of water adsorbed, as compared to 1300 BTU/lb. of water adsorbed on silica gel. Clay is roughly similar to silica gel in this respect. What does this mean? Where a very low relative humidity is required, molecular sieves are often the most economic desiccant because of their high adsorption capacity at low relative humidity. Also, molecular sieves will not give up moisture into the package as readily as silica gel or clay as temperatures rise (Figure 3). This is particularly important to packaged products which can potentially see a wide variety of environmental conditions. Molecular sieve contains a uniform network of crystalline pores and empty adsorption cavities, which give it an internal adsorptive surface area of 700 to 800 sq. m per g (1/2 the total volume of the crystals). Because of its uniform structure, molecular sieve will not give up moisture into the package as readily as silica gel or clay as temperatures rise. Being synthetic rather than naturally occurring, molecular sieve is higher in cost per unit, but due to its extremely large range of adsorptive capabilities, it might often be the best value. Lack of government approval has limited a more widespread use of molecular sieve, presumably due to the industry's unwillingness to fund an expensive government study. Independent testing suggests that molecular sieve does meet all government requirements. Calcium oxide (CaO) is calcinated or recalcinated lime having a moisture adsorptive capacity of not less than 28.5% by weight. The distinguishing features of calcium oxide (also known as Quick Lime) are: it will adsorb a much greater amount of water at low relative humidity than other materials (Figure 2); it is effective in retaining moisture at high temperatures; and it is relatively inexpensive as compared to many other desiccants. Calcium sulfate (CaSO4), better known commercially as Drierite®, is an inexpensive alternative available in suitable packaging forms. Calcium sulfate is created by the controlled dehydration of gypsum, acting as a general-purpose desiccant geared mainly toward laboratory use. It is chemically stable, non-disintegrating, nontoxic, non-corrosive, and does not release its adsorbed water when exposed to higher ambient temperatures. The low cost of calcium sulfate must be weighed against its equally low adsorptive capacity: it adsorbs only up to 10% of its weight in water vapor (Figure 2). Calcium sulfate also has regeneration characteristics that tend to limit its useful life. Although available, it is not normally sold in package form.